उत्सव नात्यांचा हा दिवाळी अंक अत्यंत सुरेख आणि अप्रतिम आहे. हा अंक वाचताना माझी उत्कंठा वाढतेय की पुढचा लेख कोणाचा असेल. असा दिवाळी अंक पुन्हा होणे नाही. दिवाळी अंक २०१७ खूप सूंदर आणि अप्रतिम आहे, मला काळच मिळाले.धन्यवाद !!! ha diwali ank hawach ahe. लवकरात लवकर स्टॉक उपलब्ध करा आम्हाला उत्सुकता आहे उत्सव नात्यांचा वाचायची. कृपया लवकरात लवकर हा दिवाळी अंक प्रकाशित करा इथे फक्त out of stock दाखवत आहेत. आम्हाला खूप उत्सुकता आहे हा अंक वाचण्याची. Available book thank very much. orderd two send before diwali. When it will be available ? Is there any other way or site to order this if not then plz make it available asap. Can you take order just now and send as soon as it is printed. When this will be available . request u to supply more stock as early as possible. Let me know as soon as it is in stock. Is there any procedure to book by payment in advance. लवकरात लवकर मिळावा हीच ईच्छा. we are eagerly waiting for this kindly avaialbe . Thanx ! avdhya lavakar out of stock??? pls lavakar uplabdh kara.. Please make this book available if you its been advertise on TV. There will be high demand.... I really looking forward to read it. Jay maharashtra.ya diwali ankache manapasun swagat.khupach garv feel hoto aahe,marathi aslyacha. Dear Team, Pls let me know what is estimated time taken for shipping. We are exciting to read zee marathi diwali ank. Speedy service! Thank you Bookganga! 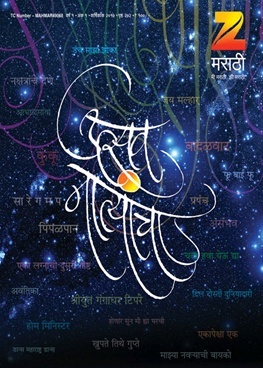 I am waiting for 10th oct.,to read Z marathi.Aank pl.make it available worldwide.It will bring new excitement in the world of diwali aank and marathi culture.Best of luck to Zee and book ganga .Go ahaed.At this occasion let us all unite and promote rich marathi culture.It is going to break all previous records of diwali aank. Other diwali aank will also get benefit of this sucess.sucess. Very much exited to know the life of stars!! Excited & Waiting for zee marathi's first Diwali Anka !!!! !